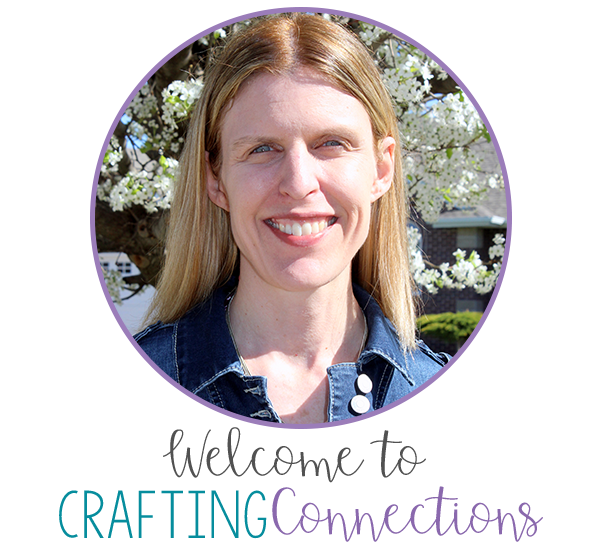 When I started co-teaching in 5th grade four years ago, Katie (my co-teacher) informed me one afternoon that summarizing was the next skill to cover. I groaned. She agreed. Many of you will not be surprised that I devised my own strategy and related it to food! Sweet food, in fact! ICE CREAM SUNDAES! Yum! Doesn't that make your mouth water? 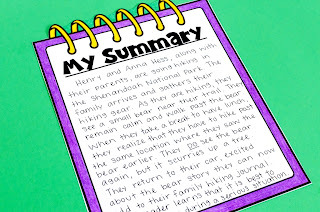 Hmmm... all of a sudden, the idea of writing a summary is a bit more enticing! The first two years I did this, I brought play-doh to the fifth grade classrooms. I sculpted a banana and cut it in half and told the students that these two banana halves represented characters and setting. Then I formed three balls to represent the three scoops of ice cream, because a good summary addresses the three sections in the book- the beginning, the middle, and the end. I flattened out a piece of brown play doh and put it on top of the first scoop of ice cream- the beginning is topped off with identifying the problem in the story. 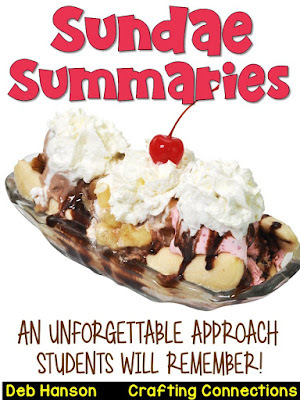 I flattened out a topping for the middle scoop and told the students that the middle of a sundae summary is topped off with explaining the most important events. I created a quick topping for the end scoop of ice cream and reminded them that the end is topped off with the resolution. Finally, I sculpted a little cherry and told them that the cherry represents the theme, and that adding the theme in a sundae summary is optional. 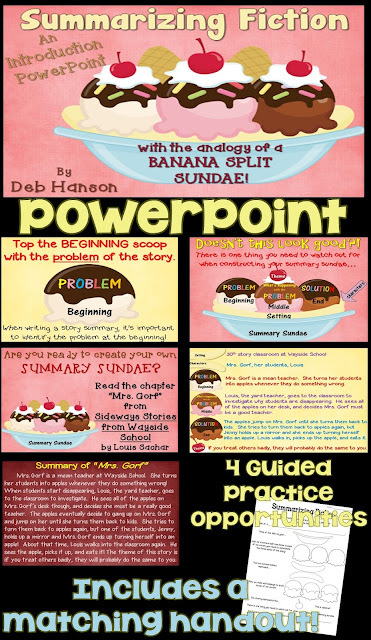 Last year I created a PowerPoint version of this analogy to share with my friends on TpT. I suggest using this (or the play-doh lesson above) on the first day of your summary unit. Clip art by Aim Less Daze. Once the anchor chart is complete, I model how to take our anchor chart (which serves as our graphic organizer) to write a summary. You might notice that I did not write the theme in the summary. I teach my students that adding the theme is optional. I didn't feel like the theme we identified was a major part of this story, so I left it out. Whew! That wasn't so bad after all! It's amazing how ice cream makes anything fun! If you like this approach to summarizing feel free to check out my PowerPoint and craftivity! Just click on the image to take a closer look at the craftivity shown below! 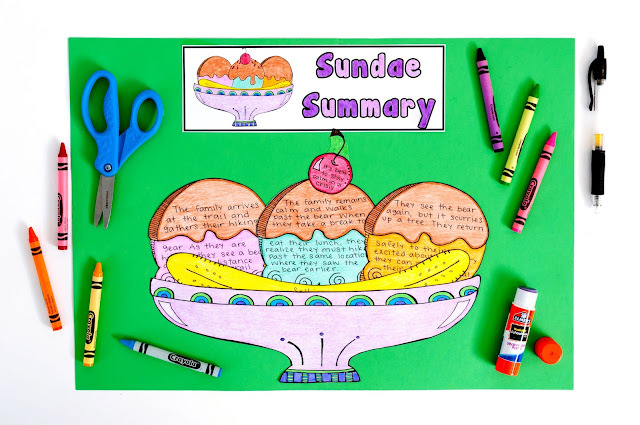 Summarizing Craftivity- After students read an original short story, students create a sundae summary followed by a written summary. What a great idea to use something we all love to teach something a bit more bland! :) Thanks for the great ideas!! My students have a hard time summarizing. They always end up telling me the WHOLE thing all over again… But I agree that ice cream makes everything much better! 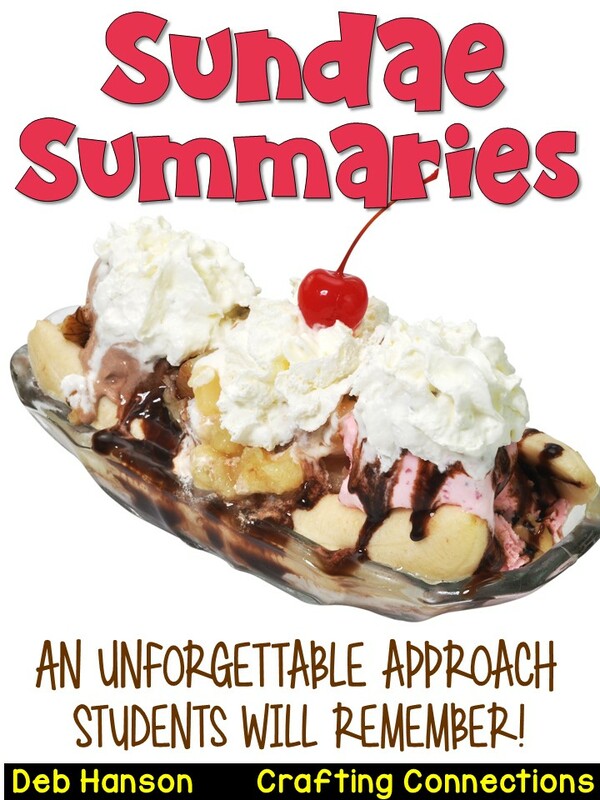 I'm teaching summarizing next week! I'm going to borrow your sundae idea, and I'm going to check out this book from the library!